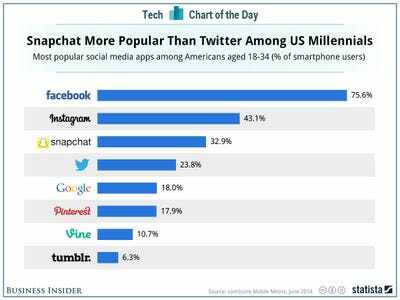 For the longest time, the three most dominant social networks were Facebook, Twitter, and LinkedIn. But now, after the company turned down a $US3 billion acquisition bid in November and talks of a $US10 billion valuation earlier this year, there’s no app hotter than Snapchat right now. There’s data to prove it: According to the latest data from ComScore, which was charted for us by Statista, Facebook and Facebook-owned Instagram are the most popular social platforms among users 18-34, but Snapchat is right behind those networks — and actually ahead of Twitter. It’s quite the incredible jump when you consider Snapchat’s audience penetration has almost doubled in nine months’ time, as the company’s audience was only 12.1% in November.